Last time I took you through a tale of woe… and a surprising amount of fury… but not today! Oh no, today I have a joyful tale full of smugness and even more smugness. And to add just that little bit more smug to the massive pile of smug over there… this project was a stash buster! 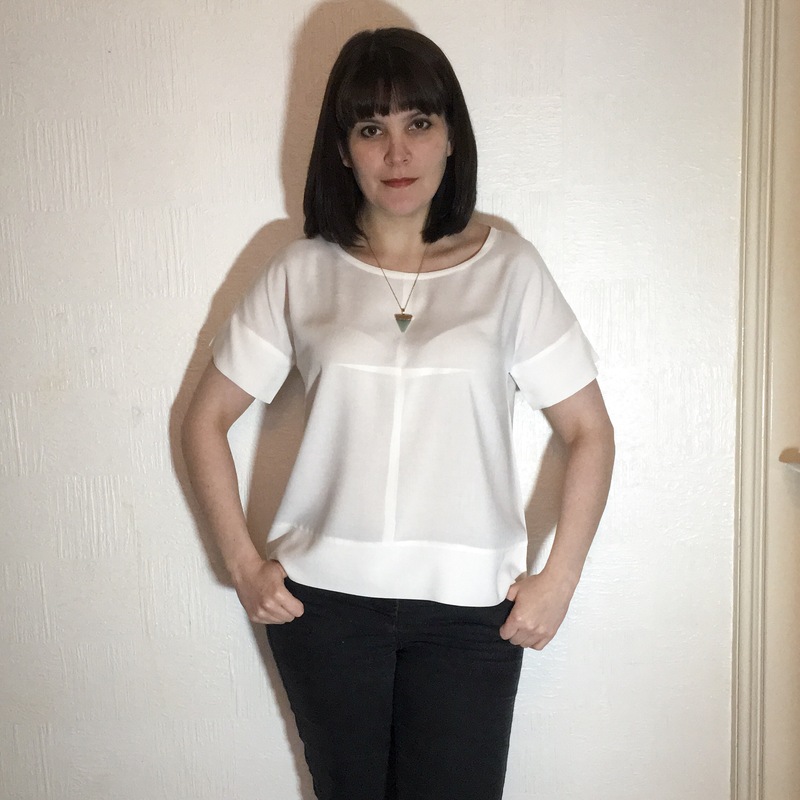 And before you say anything… yes when the photos were taken I did note how see through this blouse is… and will only ever be wearing it with a vest or a camisole under it, but for now let’s pretend the evening photos with bright lamp doesn’t mean you can see my bra!! Erp! So let’s get into the details. This beauty is Butteick 6182 which is part of the Lisette pattern series. I’ve heard mixed reviews from this one… the main one being that there’s only one bust size, and because the darts are centre front, it’s very tricky to do a FBA. However I figured this really wasn’t going to affect me, and I love the details in it so figured it was good to go. I also mentioned that this was a stash buster, I used up the meter of white viscose I aquired at Fabric Land last year, and I managed to squeeze the whole thing out of the one metre too!! Bonus! 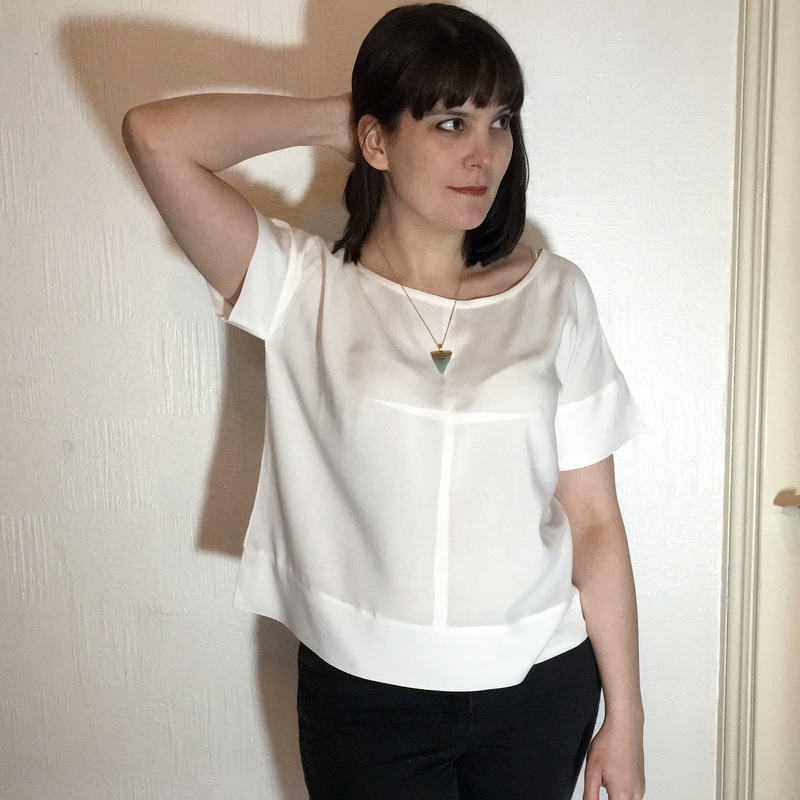 I just dove straight in with a size 10 for mine… I am a 10 in UK sizes and I’ve used Butterick before so I just trusted that it would fit… plus positive ease hides all sorts of sins! 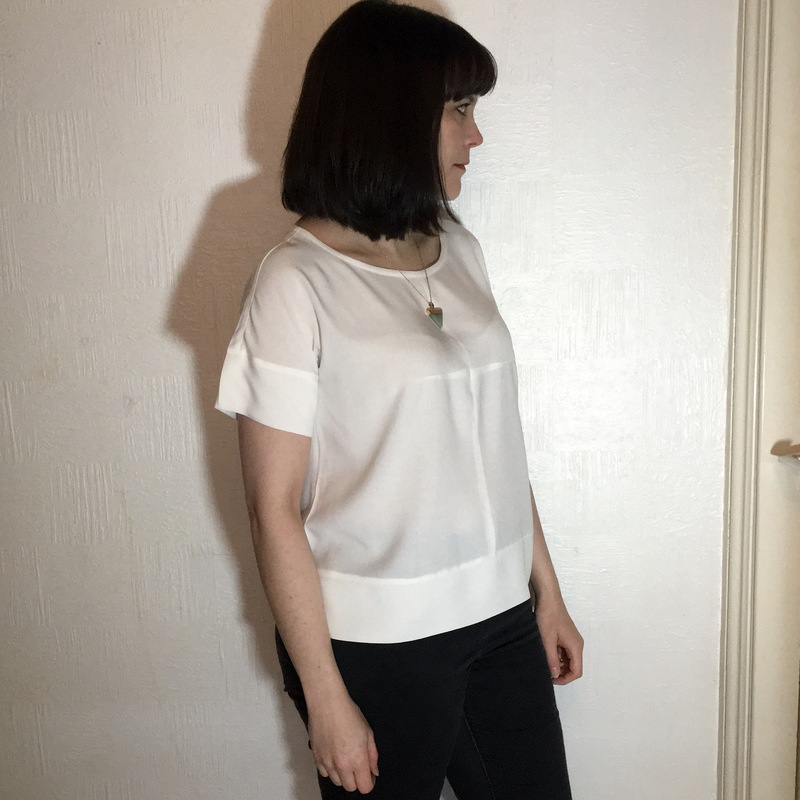 The shape is very nearly perfect, and I only say very nearly because it’s a cropped length top. I wondered about this, part of me really liked the length of it (very ‘to point’ on fashion at the moment), but the other part (apparently the louder part) reminded me that I like things to cover my hips and belly. 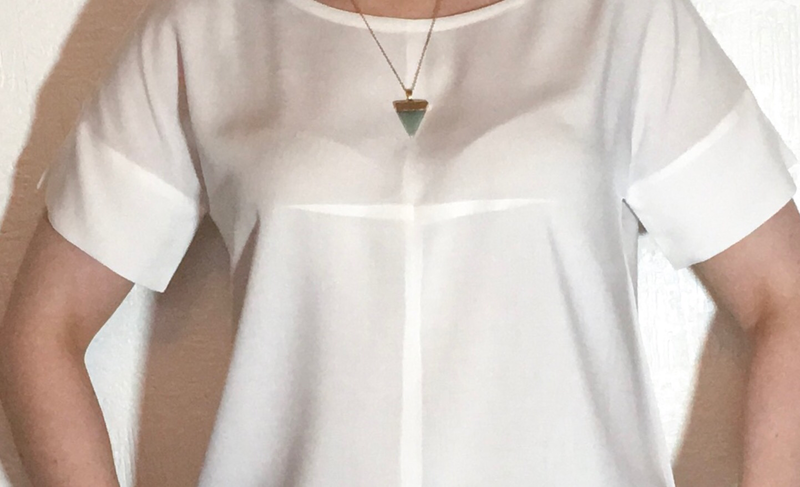 So I solved the cropped length issue by adding a big cuff onto the bottom… by that I mean I copied the sleeves technique with a bloody big rectangle of fabric. I think it worked! It gives a good balance to the blouse. It’s like they’re just whacked onto the side of the shoulders, but it really works well, kind of kimono style. 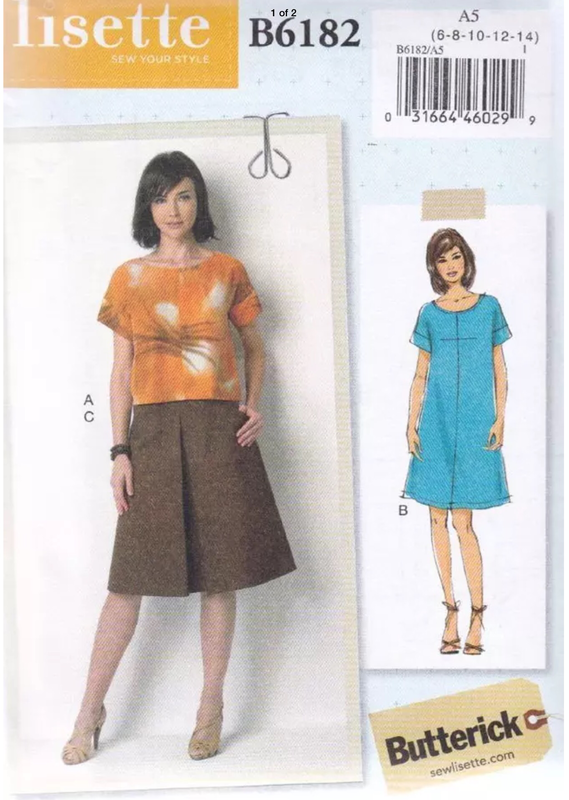 I really can’t fault the top, the pattern is great, the instructions are nice and clear, it fits just perfectly, and it can be whipped up in around 3.5 hours! That’s including the cutting people! I will confess that this took two attempts to get them matching, and they’re still off by a millimetre, but trust me it’s worth taking the extra time to match it up, it’s the first thing you notice about the blouse. I did go off pattern and made my own bias binding for the neckline, flipping the whole thing inwards. I don’t think this would have been greatly different from the thin interfacing the pattern asks for… and I just love a bias bound finish. So there you go… for every sewing fail… there is an awesome sewing win! !